PHOENIX, Ariz. (July 25, 2016) For the second straight year there will be a whopping $250,000 bonus on the line in Arizona this January. Keyser Manufacturing is back as the title sponsor of the 2017 Keyser Manufacturing Wild West Shootout and will again present the Keyser Quarter-Million Challenge as the desert miniseries moves to Arizona Speedway near Phoenix for six races between Jan. 7-15. The challenge offers $250,000 to any driver sweeping all six Wild West Shootout Late Model features. Any driver winning five features will earn a $100,000 bonus and a $50,000 payday will go to any driver winning four races. The lucrative bonus helps set the stage for another attractive trek west for Dirt Late Model teams and fans looking for offseason racing in a warm climate. The big difference this time around will be the stage on which the event will take place. Located to the southeast of Phoenix in the Queen Creek suburb, Arizona Speedway will host the Wild West Shootout for the first time in 2017 as the miniseries leaves USA Raceway after a six-season run at the Tucson oval. The event will once again feature six nights of racing stretched over nine days with Mesilla Valley Transportation – Border International USRA open-wheel modifieds and Xmods also in action. The first five nights of racing will each feature $5,000-to-win Late Model main events, while the finale on Jan. 15 will pay $12,000 to the feature winner, a $1,000 increase over the 2016 Wild West Shootout finale’s winner’s purse. Arizona Speedway promoter Jonah Trussel believes his track is an ideal location for one of Late Model racing’s most popular early-season events. The Wild West Shootout will be the track’s first high-profile Late Model event, but it has hosted a number of larger sprint car races, including its first World of Outlaws Craftsman Sprint Car Series event in March. Kearns, who took over the Wild West Shootout with co-promoter Kevin Montgomery following the 2014 event, was pleased to land Arizona Speedway as the new Wild West Shootout host after leaving Tucson with uncertainty surrounding track management. Along with the immediate benefits in the move to Arizona Speedway, Kearns hopes the Wild West Shootout’s new host will provide a stable home for the miniseries for years to come. The Wild West Shootout has flourished over its decade of existence even through periods of uncertainty surrounded the tracks hosting the event. Beginning as a spinoff from Ernie Mincy’s Early Thaw Series that first popularized offseason Late Model racing in Arizona in the early 2000s, the Wild West Shootout was originally launched by promoter Benji Lyons at Central Arizona Raceway in the Casa Grande, Ariz., in 2006. The miniseries had a solid three-year run at Central Arizona with notable drivers like Billy Moyer of Batesville, Ark., and Jimmy Mars of Menomonie, Wis., helping to draw interest from the Dirt Late Model base back East. The event hit a snag when Central Arizona Raceway closed midway through the 2008 season, forcing the Wild West Shootout to go on hiatus in 2009. A move to Tucson allowed the event to return with gusto in 2010. With USA Raceway as its host and with DirtonDirt.com’s live pay-per-view coverage beginning in 2012, the Wild West Shootout thrived in Tucson. But the track has also been plagued with uncertainty following management changes of its own that eventually sent Kearns and Montgomery looking for a more stable host. 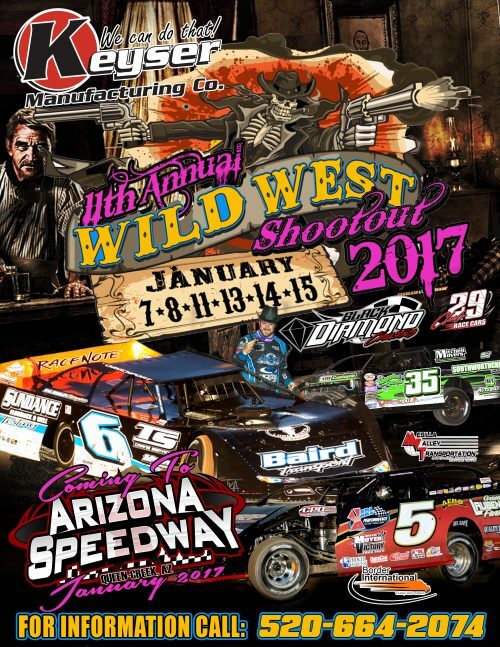 The 2017 Keyser Manufacturing Wild West Shootout will follow the event’s traditional schedule with back-to-back events opening the miniseries on Jan. 7-8. After a two nights off, action resumes with a mid-week event on Wednesday, Jan. 11. Following another night off on Jan. 12, the miniseries wraps up with three straight races Jan. 13-15. For more information, visit www.wildwestshootout.net.